Around our house, we are big fans of anything Italian. Foods like pizza, spaghetti, lasagna, veal and chicken Parmesan and Fettuccine Alfredo are on the top of that list. Hubby doesn't care for garlic bread but I LOVE it so that makes side dishes interesting. :) Since I have a new baby and am breastfeeding her, I have not been eating anything Italian and boy do I miss my lasagna and pizza. I still fix Italian foods for my family and we are always looking for new sauces to try in our dishes. Hirzel Canning Company, a fourth generation family-owned business, has developed the reputation of a strong, honest, family-oriented brand that maintains integrity in the quality of products produced. With our Dei Fratelli brand, we take great pride in using only the finest ingredients to make our tomato products. From cultivating our own seedlings, to the canning process and delivering to grocers, we've taken great care and attention to produce quality tomato products, from our family table to yours. We've never waivered in our commitment to produce the very best gluten-free all-natural tomato products, pasta sauces, salsas, tomato juices, sauerkraut and other tomato products. Our team works together to bring the very best, most trusted products to your kitchen. To us, there is a great deal of pride being part of so many family meals each day. To us, Dei Fratelli all-natural tomato products are more than just rich, robust flavors ... they're products that bring families together. It just doesn’t get any better than that. Being that my family LOVES anything Italian, I jumped at the opportunity to review some of Dei Fratelli's products. I was very excited about this review. These products arrived just a few days before my baby was born and I didn't get to them right away but once I had the opportunity, I fixed a fabulous supper for my family using Dei Fratelli. So, for this review I was sent a jar of Traditional Pasta Sauce and also, a jar of their Salsa in the medium flavor. We love salsa, especially on the weekends when hubby and I are chilling out with a bowl of tortilla chips...usually after the children have gone to bed for the night. :) Late night snacking is so fun. One evening, hubby requested chicken Parmesan for dinner and this opened up a fantastic opportunity to try out the Dei Fratelli Traditional Pasta Sauce. Oh my. So good. One thing I noticed was that there was just a hint of spice in this sauce. It wasn't SPICY, it just had a tiny bit of "zing" to it, if you know what I mean. My husband really enjoyed the taste. Actually, all of my children enjoyed it as well. It sure made supper easy and delicious for them! This is something that is hard to achieve...especially with my children. The sauce was hearty, meaning it wasn't smooth in texture. I love a heartier sauce! So, when thinking about an amazing Italian meal for your family, I would highly recommend Dei Fratelli and their products. Very yummy and reasonably priced too. Be sure to check them out on Facebook and also on Twitter. Disclaimer: I received no monetary compensation for this post. 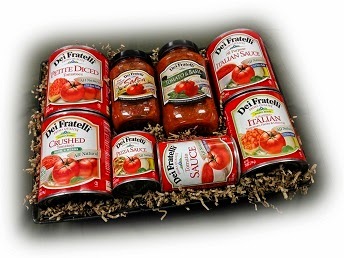 I did receive a free Dei Fratelli products for review purposes. All quotes and stock photos are from the Dei Fratelli website and email. All thoughts and opinions are 100% mine. I haven't tried this brand yet. You make it sound soo good, I'm getting both the medium salsa and one of their sauces!! !